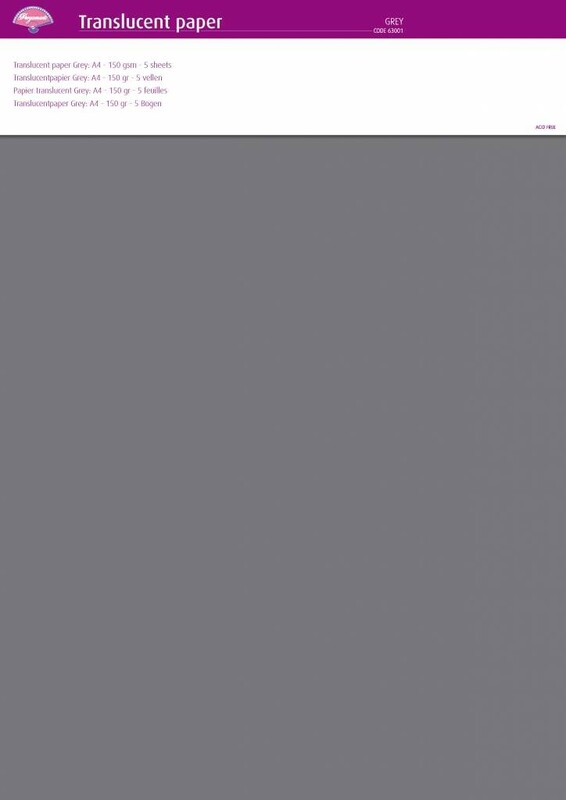 150g Purple parchment paper, transparent paper which comes in either bright or soft pastel colours. It is suitable for many creative purposes. On this paper you can perforate and emboss with the different Pergamano tools. In this way you are able to make the most beautiful invitations, greeting cards, boxes, gift tags, stamping cards and memory decorations. Also suitable for laser printers. 150g Violet parchment paper, transparent paper which comes in either bright or soft pastel colours. It is suitable for many creative purposes. On this paper you can perforate and emboss with the different Pergamano tools. In this way you are able to make the most beautiful invitations, greeting cards, boxes, gift tags, stamping cards and memory decorations. Also suitable for laser printers. 150g Anthracite parchment paper, transparent paper which comes in either bright or soft pastel colours. It is suitable for many creative purposes. On this paper you can perforate and emboss with the different Pergamano tools. In this way you are able to make the most beautiful invitations, greeting cards, boxes, gift tags, stamping cards and memory decorations. Also suitable for laser printers. 150g Ice Blue parchment paper, transparent paper which comes in either bright or soft pastel colours. It is suitable for many creative purposes. On this paper you can perforate and emboss with the different Pergamano tools. In this way you are able to make the most beautiful invitations, greeting cards, boxes, gift tags, stamping cards and memory decorations. Also suitable for laser printers. 150g Lilac parchment paper, transparent paper which comes in either bright or soft pastel colours. It is suitable for many creative purposes. On this paper you can perforate and emboss with the different Pergamano tools. In this way you are able to make the most beautiful invitations, greeting cards, boxes, gift tags, stamping cards and memory decorations. Also suitable for laser printers. Beige 150g parchment paper, transparent paper which comes in either bright or soft pastel colours. It is suitable for many creative purposes. On this paper you can perforate and emboss with the different Pergamano tools. In this way you are able to make the most beautiful invitations, greeting cards, boxes, gift tags, stamping cards and memory decorations. Also suitable for laser printers. Slate - a transparent parchment paper, 5 sheets of A4 size 150g weight paper. Wine Red 150g parchment paper, transparent paper which comes in either bright or soft pastel colours. It is suitable for many creative purposes. On this paper you can perforate and emboss with the different Pergamano tools. In this way you are able to make the most beautiful invitations, greeting cards, boxes, gift tags, stamping cards and memory decorations. Also suitable for laser printers. Yellow 150g parchment paper, transparent paper which comes in either bright or soft pastel colours. It is suitable for many creative purposes. On this paper you can perforate and emboss with the different Pergamano tools. In this way you are able to make the most beautiful invitations, greeting cards, boxes, gift tags, stamping cards and memory decorations. Also suitable for laser printers. Lemon 150g parchment paper, transparent paper which comes in either bright or soft pastel colours. It is suitable for many creative purposes. On this paper you can perforate and emboss with the different Pergamano tools. In this way you are able to make the most beautiful invitations, greeting cards, boxes, gift tags, stamping cards and memory decorations. Also suitable for laser printers. Reed Green 150g parchment paper, transparent paper which comes in either bright or soft pastel colours. It is suitable for many creative purposes. On this paper you can perforate and emboss with the different Pergamano tools. In this way you are able to make the most beautiful invitations, greeting cards, boxes, gift tags, stamping cards and memory decorations. Also suitable for laser printers. Taupe 150g parchment paper, transparent paper which comes in either bright or soft pastel colours. It is suitable for many creative purposes. On this paper you can perforate and emboss with the different Pergamano tools. In this way you are able to make the most beautiful invitations, greeting cards, boxes, gift tags, stamping cards and memory decorations. Also suitable for laser printers. 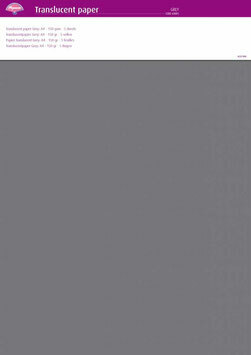 Grey 150g parchment paper, transparent paper which comes in either bright or soft pastel colours. It is suitable for many creative purposes. On this paper you can perforate and emboss with the different Pergamano tools. In this way you are able to make the most beautiful invitations, greeting cards, boxes, gift tags, stamping cards and memory decorations. Also suitable for laser printers.